the bow of the "S.V. Moonraker"
Whether cruising the Intracoastal Waterway (ICW) or making offshore passages, the Carolinas are a big part of any trip along the East Coast of the United States. They offer many well-marked inlets to safely plan ocean passages. The coastal region has many interesting towns to visit and is rich in historical significance. There is nightlife, fine dining, local flavor and plenty of good southern hospitality. The Carolinas offer something for everyone in the boating community. 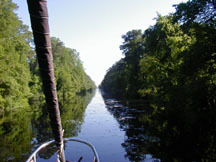 An excellent way for the southbound boater to enter North Carolina is by way of the Dismal Swamp Canal, (252-771-8333). This wonderful passage is anything but dismal. When leaving Norfolk, VA turn to starboard off of the main ICW onto Deep Creek, at about Mile Marker Eight just after the route 64 high rise bridge. You officially enter the Dismal Swamp Canal at the Deep Creek Lock. Lock Master Robert Peek, a man who truly enjoys his job, will likely invite you into the original lock keeper's house for coffee and doughnuts while he gives an interesting and informative rundown of the Canal's history. Be sure to ask him about the stone mile markers. After locking you through, he jumps in his truck and races to a drawbridge about a half-mile past the lock and turns you out into the canal. During the peaceful and scenic 23-mile transit of the canal you cross from Virginia into North Carolina. Just across the state line you pass the North Carolina Visitor Center, which offers 400 feet of dockage for overnight stops. At the south end of the canal you reverse the bridge and locking procedure at South Mills and enter the Pasquotank River. The breathtaking run down this winding river takes you to Elizabeth City, NC. Known as the "Harbor of Hospitality", Elizabeth City (www.cityofec.com), offers boaters free dockage for up to 48 hours at Mariners Wharf. As if that is not enough, Elizabeth City also has the "Rose Buddies". Over 15 years ago the Rose Buddies	began a tradition that continues today. After greeting the boaters and offering a rose to the ladies, Fred Fearing (one of the original Rose Buddies) and his fellow ambassadors of hospitality host a wine and cheese party to welcome the visiting boaters and acquaint them with this wonderful town. It is an excellent spot to meet fellow cruisers, swap sea stories and wait out any adverse weather before crossing the Albemarle Sound. Leaving Elizabeth City behind and continuing down the Pasquotank River will take you past a most unusual structure to your starboard side. This large elongated dome-like structure is a blimp building facility. Originally built to provide blimps for World War II, it still produces the flying billboards today. Past this landmark the Pasquotank enters the Albemarle Sound and rejoins the main ICW just above the Alligator River Bridge. While this bridge normally opens on request, it cannot open in high winds. If winds exceed 35 knots, and if gusty conditions warrant, the bridge may remain closed at the bridge tenders discretion. So plan accordingly if conditions deteriorate and have alternate plans. Just north of the bridge to starboard is the Alligator River Marina, the only marina between Elizabeth City and Belhaven, fifty miles to the south. Good anchorages exist as you continue down the Alligator River just above the Alligator-Pungo Canal. This 23-mile canal connects the Alligator and Pungo Rivers and provides continuation of the ICW. There is another anchorage just below the canal on the west side after you enter the Pungo River that is well protected and scenic. Further down the Pungo River is Belhaven, (http://belhavennc.us), home of the famous River Forest Manor. Several marinas offer services and facilities and the center of town is close to the waterfront. A short walk down tree lined streets and you can find most needed provisions. The Pungo River continues the ICW south entering Goose Creek as you pass through to the Neuse River. Several creeks branch off of Goose Creek in this area and offer a good selection of anchorages for varied wind conditions. It is a beautiful spot to stop for the night, just be careful of the crab traps that are prolific in these creeks. The Neuse River is one of the widest rivers in the country and offers a good opportunity to sail or open up the throttle a bit as you head down toward Oriental, NC. Oriental, (www.oriental-nc.com), is a small town that offers many services at its various marinas and boatyards. Oriental offers restaurants and cafes, marine hardware stores, grocery and post office within a reasonable walk from the docks. Oriental is a boating town that caters to the needs of boaters and can provide most needed services and supplies. Leaving the ICW and continuing up the Neuse to where the Trent River joins will bring you to the city of New Bern, (www.visitnewbern.com). The Tyron Palace, (www.tryonpalace.org/), originally built in 1767 and once the seat of royal government is a short walk and is open for tours. The building has been completely restored based on the original plans and the gardens are spectacular. Visit Mitchell's Hardware, an old time hardware store that offers almost anything you could need (including a nostalgic trip back to days before the hardware mega store) in its narrow and cluttered aisles. They also carry many stainless screws, nuts, bolts and other marine items. The "Pak-a-Sak" grocery store is a short walk and is a full grocery and not just a convenience store for your provisioning needs. Backtracking down the Neuse puts you on the ICW again at Adams Creek and from there, a short run to Beaufort (pronounced bo-furt) NC, (www.beaufortnc.org). This pronunciation is important since there is a Beaufort (pronounced beuw-fert) SC, and the improper pronunciation in either town will earn you constant correction. Beaufort is great stop for boaters and offers the first real opportunity to go offshore below Cape Hatteras, (www.nps.gov/caha/), via Beaufort inlet. Beaufort is a jumping off point for many travelers headed for distant points in the islands and along the east coast as well as for those looking for shorter day sails or overnight passages. It is well marked and offers good ocean access entering or leaving. Taylor Creek offers options for both anchoring and dockage with easy access to town, but can get crowded and may require two anchors in a Bahamian moor to reduce swing in the strong reversing current. Town Creek, while not as convenient to town, has both anchorages and dockage without the currents of Taylor Creek. Beaufort has many good restaurants and shops, a laundromat and post office right on the waterfront. Beaufort Marine, (800-BOATER1), has a good inventory of parts and supplies, and Scuttlebutt Books has a full range of charts and guidebooks. The Royal James Cafe, touts the best cheeseburgers in North Carolina, try the double cheeseburger "all the way". The North Carolina Maritime Museum, (www.ncmaritimemuseums.com), is an enjoyable visit to the area's history, natural beauty and rich maritime traditions. Across Taylor Creek opposite the town waterfront is an island that is part of the Rachel Carson Wildlife Estuary where several wild ponies can often be seen wandering the shoreline. The area also lays claim to being the famous pirate Blackbeard's, (www.blackbeardthepirate.com/), homeport. It is believed that one of his treasure ships was found wrecked on one of the local shoals. 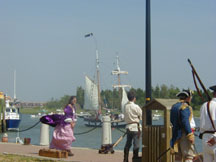 The area is rich in pirate lore and, along with neighboring Morehead City, (www.moreheadcity.net/), hosts a weekend Blackbeard Festival in the spring including an attack of the harbor by pirate ships with canons blazing. While there are no extensive provisions conveniently located, the North Carolina Maritime Museum offers a courtesy car that can be used to provision and supply. Beaufort is a very enjoyable spot to visit and a walking tour of the historic district takes you down lovely tree lined streets past beautiful homes (most with plaques bearing dates and original names) and the old cemetery. It should be a part of any visit to coastal North Carolina. Wrightsville Beach, (www.visitwrightsvillebeachnc.com), can be reached either by going offshore or by continuing down the ICW. There are marinas and anchorages that provide access to this relaxed beach town. A short ride to the town dinghy dock puts you a block and a half from the beaches to enjoy the sand and surf. There is a laundromat just off the dock as well and it is a short walk to Roberts Groceries offering a wide array of supplies. Kohl's Frozen Custard is next to the laundry and is a treat that can't be missed. Nightlife abounds as well at local restaurants and clubs. Wrightsville Beach adds yet another flavor to your North Carolina visit. Transiting the Cape Fear River can be two totally different experiences depending on the tide. If your trip is at slack or with the current it can be a swift passage. If you are fighting the 3-4 knot current it can be a long grind. Best advice is to try to time the currents if safely possible or take the current into consideration when plotting your time schedule if you cannot. Study your charts and watch your marks closely on this busy waterway. The mouth of the Cape Fear River is another well-marked inlet allowing ocean access. On the north side of the river entrance is Bald Head Island, (www.baldheadisland.com/), a resort community that can only be accessed by boat or ferry. The island has a marina and miles of beautiful beaches. There are vacation rentals and homes on the island and is a popular destination for beach vacations. Travel on the island is by golf cart as no cars are allowed. The marina has a well-stocked store and is a nice stopping point on the route. On the river's south side the ICW continues at the town of Southport. Southport, (www.southport.org/), offers convenient marinas and some limited services and provisions. The wonders of coastal North Carolina are easily experienced from the many waterways available to boaters. The natural beauty of the area is on display in many different forms. The variety of wildlife, waterfowl, sea creatures and fish are abundant. The history is captivating and the people are friendly. All this put together make this one of the most enjoyable boating experiences available anywhere. Notice: This information is current as of August 2001. It is recommended that you contact the numbers, and/or visit the websites above to determine any changes to the information.